We have it figured out. Our trucks are large enough to get the job done but small enough to let you get your work done. If you’re a residential contractor you want to stay on schedule with no delays. We work with you to make this happen. Our dependable crews respond to you within 24 hours guaranteed. Huge 30 yard dumpsters, offered by our competitors, are too big for residential sites. Bigger dumpsters cover the entire site leaving no room for subs to work. Bigger dumpsters get in the way of utilities that need to be run underground, slowing progress, causing delays and putting contractors behind schedule. Sometimes costing fees for wasted trips by utility contractors. 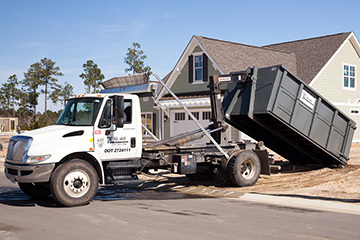 We can place our dumpsters in a more user friendly location on your site because our trucks are equipped with top of the line hook lift hoist so there’s more maneuverability than traditional roll off trucks. making them easy to drop off, place, use and pickup. We keep our trucks well serviced, well maintained, clean and reliable so you don’t have to worry about leaks on your asphalt or driveways.